Ports from New York to Cuba are spending massively to compete for bigger ships coming through expanded canal. MIAMI – The Panama Canal’s original set of locks have served the country – and the wider world of international shipping – extremely well for more than 100 years. So, the question now is how long –and successful – will its new, expanded locks last? Inaugurated on Sunday, at a cost that will likely significantly exceed the original contracted price of $5.25 billion, another 100-year run would be ideal. But a slowdown in global trade coupled with increasing competition for the lucrative routes between north Asia [China, Japan, South Korea and Taiwan] and the United States on bigger and bigger vessels stacked high with cargo containers, has created enormous uncertainty in the industry, say global shipping experts. The newly-expanded Panama Canal has set off a tug-of-war between ports along the U.S. East Coast and Gulf Coast competing for shipments from Asia, a large part of which currently goes to California to be sent cross-country via rail. U.S. ports have invested tens of billions in dredging to deepen their access for the larger “neo-Panamax” ships, as well as building new port facilities. But experts question whether current trade growth warrants such massive expenditures. The current Asia-U.S. trade is split between three routes: Suez, Panama and through U.S. West Coast ports and rail links known as the inter-modal freight system. "The Panama Canal is not going to make a big difference overnight," said Jim Kruse, director of the Center for Ports & Waterways at the Texas A&M University. That's in part because few ports on the U.S. East Coast and in the Gulf of Mexico are not yet fully prepared to handle the largest containerships that will be able to transit the new locks. Also, larger vessels make longer voyages more economically viable, experts point out, noting that Egypt’s Suez Canal route has taken some Asia trade away from Panama in recent years. In 2013 the Maersk Line, the world’s biggest container shipping company, shifted much of its Asia –U.S. East Coast business away from Panama, choosing to switch to bigger ships that can transport cargo more profitably through the Suez Canal. Maersk may choose to return to Panama now that the expansion is completed, but despite its new locks which can handle cargo ships almost three times the size of its current capacity, Panama is still outmatched by Suez, a far wider sea level canal with no locks. Shipping lines have invested heavily in recent years in a new generation of "Neo-Panamax" ships, the largest of which have already outgrown the capacity new canal locks. Also, with more trade shifting from China to South-East and Central Asia - India and Vietnam - that geographically favors the Suez route, said Kruse. The most common routes in the United States. Only the ports with deeper draughts will be able to receive these bigger cargo ships. trade-embargo with Cuba is lifted. 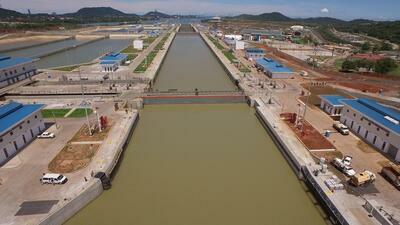 Despite the larger locks availability, many cargoes will continue to move on smaller vessels such as they do today. For example, the canal has historically been a major conduit for corn and soy beans that are shipped by barge down the Mississippi river and loaded onto ships headed for Asia. Those cargoes are generally carried by smaller ships and so are not affected by the canal expansion. Other bulk cargo, such as iron ore, coal or super-tankers carrying crude oil are too large even for the new canal locks and must still use other routes such as Suez, or the Magellan Straits at the tip of South America. One future trade that Panama might benefit from is the boom in liquid natural gas (LNG) being produced in the United States. 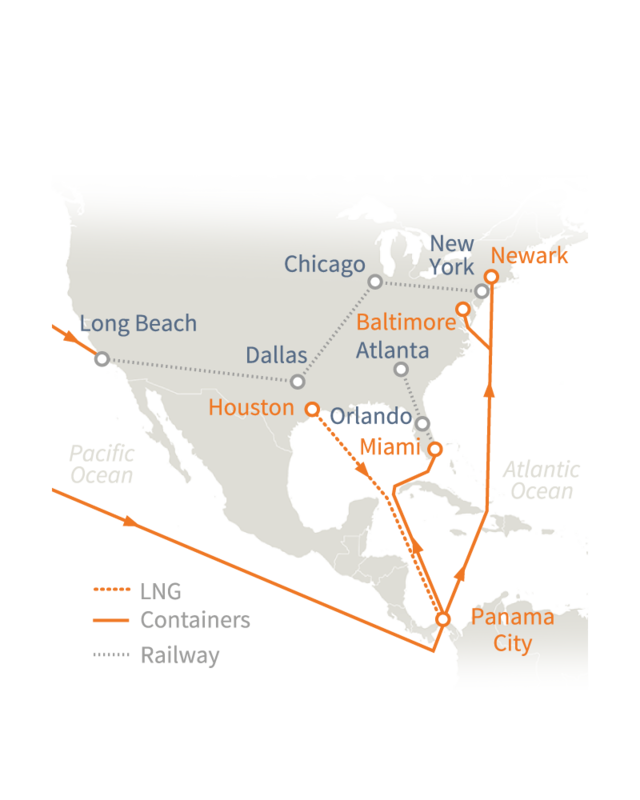 LNG is transported around the world in ships that up to now could not transit the Panama Canal. With the opening of the new locks, however, most LNG carriers will be able to transit through Panama to Asia significantly reducing the distance to Asia markets and some analyst are projecting LNG from the U.S. Gulf to Asia becoming a huge business for Panama. Will container trade, LNG and perhaps some future, yet unidentified, trade bring enough business to Panama to pay for canal expansion? A dispute with the European consortium that built the new locks is still going through arbitration. The final price could end up being as much as $2 billion higher than the $5.25 billion contract. Will that bring enough trade to Panama to pay for the canal expansion? A dispute with the European consortium that built the new locks is still going through arbitration. The final price could end up being as much as $2 billion higher than the $5.25 billion contract. Canal officials say revenues – over $2.6 billion last year – are more than enough to meet the costs under the financing terms for the expansion. In 2015 they set new records for tonnage in containers, as well as liquid bulk as a result of diesel, gasoline and propane exports from the U.S. Gulf Coast to South America and Asia. The economic fate of the newly-expanded Panama Canal depends in part on the competitiveness of ports along the U.S. East Coast and Gulf Coast to handle shipments from Asia, a large part of which currently goes to California, Washington and Canada to be sent cross-country via rail. A big question for both the Panama Canal and the U.S. East and Gulf ports is how much of that business will shift to the all water route through Panama. U.S. ports along the eastern seaboard and in the Gulf ould struggle to justify their investments in dredging and new port facilities, some experts say. “Many of the projects really can’t be justified based on the Canal expansion. Deepening and other port projects are very expensive and the business just isn’t there even if there is a significant shift from the West Coast intermodal system to make economic sense for all but a few major ports.” said Wainio. In any case, Panama won’t feel the full effect for a while as some of the ports are not ready yet. For example, the Bayonne Bridge, which stands between the New York-New Jersey container terminals and the Atlantic, must be raised 100 feet to accept the larger ships. The $1.3 billion project won’t be ready until the end of 2017. Among the East coast ports with the best shot at landing the largest container vessels that can pass through Panama is Miami where the county-run port has already deepened its shipping channel to handle the bigger “neo-Panamax” ships, as well as adding a rail link and a new tunnel. “The deep water is a game changer for us,” aid Miami’s port director and CEO, Juan Kuryla. Currently, 55% of the products consumed in Florida don’t come in through its own ports. Instead, container ships bypass Miami and unload cargoes destined for Florida cities at ports like Jacksonville in north Florida and Savannah in Georgia. Miami also hopes it could become a transshipment point to break up cargo on larger ships after they come through the canal. While Miami has its hopes set high, it faces competition from other ports with perhaps better locationsfor transshipment, including Colon in Panama; Kingston, Jamaica; Freeport in the Bahamas; Moin in Costa Rica; and Cartagena and Barranquilla in Colombia. Cuba is also jockeying to be added to that mix. Its new deepwater port at Mariel could join the fray as soon as the 50-year-old U.S. economic embargo against Cuba is eliminated; an increasingly likely outcome after the two countries resumed diplomatic relations last year. With half the land mass of Singapore, Mariel has plenty of room to expand and sits only 100 miles off the Florida coast. For the time being, the embargo bans ships that visit Cuba from entering U.S. ports for 180 days. “When that changes I suspect that Mariel will become the first port after Panama on routes from Asia and the west coast of South America,” said Charles Baker, general manager of the container terminal at Mariel. “Mariel is beautifully positioned to receive all of that cargo and enter it into Miami or smaller ships to Mobile [Alabama], Tampa [Florida] and New Orleans [Louisiana], he added. Some question Mariel's optimism, especially given the current limited scale of economic activity on the communist-run island. Its location isn't ideal either, some say. “It’s on the wrong side of the island to fully benefit from the lucrative U.S. east coast route,” said Wainio, pointing out that it sits on the northwest coast near Havana, and would be better off on the eastern end of the island closer to the main shipping channels coming up from Panama. Some question Mariel's optimism, especially given the current limited scale of economic activity on the communist-run island. Its location isn't ideal either, some say. “It’s on the wrong side of the island,” said Wainio, pointing out that it sits on the north coast near Havana, and would be better off on the south coast facing Panama. But Baker says the investment in Mariel, financed by almost $1 billion from the Brazilian development bank BNDES, is a long-term bet. “Miami will have to fight for the cargo going forward when we are ready,” he predicted.